Sometimes people come into my office and say “My husband (or my wife) will (or won’t) give me a divorce”, as if a divorce is an item that can simply change hands. Divorce is a process, often a long process, that has many stages. Each stage must be experienced, even if it doesn’t take long, before you can get to the end and announce that you are divorced. The first step in the divorce process is realizing that the marriage is not successful from at least one person’s point of view. That person will probably spend a long time thinking over whether they are sure. The disruption of life, the inevitable losses that are attached to divorce, must be weighed against the problems in the marriage. Whether the marriage is salvageable, whether both people can manage financially if they separate, whether the children will be able to weather a separation, whether the tangle of personal relationships with friends and family members can be satisfactorily sorted out all have to be considered along with the disadvantages of staying married. Marriage counseling is often attempted in this step, and when successful, the parties leave the process and continue their marriage. Once at least one person has concluded that the marriage needs to end, the second step begins — informing and working with the second person to see how they feel about the situation. If the second spouse agrees that the marriage is over, the parties can proceed to step three. But many times the second spouse is caught by surprise; even if they have not been entirely happy, they were not considering splitting up. This common circumstances often results in very emotional episodes between the parties, reviewing their past, their respective expectations and the consequences of splitting. Step Three involves selecting the process the couple will use, to separate. If the couple has a shared perspective – both think separation is necessary or unavoidable — they can choose the process together. If only one has decided to leave the marriage, that person will act unilaterally. 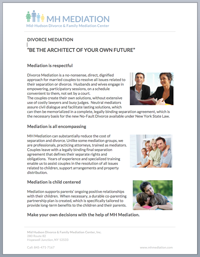 To further understand the procedural choices, read about Mediation on mhmediation.com, and about Collaborative Divorce and Litigation on my website, lazarandschwartz.com. Step Four involves either making all the decisions that have to be made, or letting a third party make those decisions. Once the decisions are made, paperwork is prepared and submitted to the Court, and the Judge signs a Judgment of Divorce. Only a court can grant a divorce — not a spouse. The average time it takes to get through this process can vary from three months to three years, depending on how agreeable the couple ends up being. The more settled the parties are about separating, the more organized their finances are, and the more agreeable the parties are, the shorter the time it takes to complete all the steps from beginning to end. Reaching agreement sooner rather than later has the added benefit of costing considerably less than if one party digs in and refuses to settle. In my experience, Mediation clients generally complete the initial stages of the process – Stages 1 – 3 – within three months. People who engage in Collaborative Divorce generally complete those three processes within six to nine months, and the average Litigation case takes twelve to twenty four months. Of course, each case is different, and the harder it is to resolve, the longer it takes. So in the divorce, as in all things, time is money.